Shawnee, Kan.----Shari Lynn Carpenter Speer died the morning of March 17, 2004, due to heart failure, at the age of 54. She was the first of four daughters born to Harlan and Maxine Carpenter and was remembered for a great smile. At the age of 3, Shari contracted polio and endured at least one surgery a year for the first 30 years of her life to correct physical disabilities of her legs. Despite the challenges from polio, she led a full and active life. 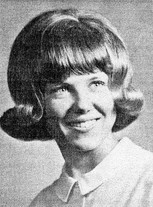 After graduating from Billings West High in 1967, she married Dave Bennetts on August 3, 1968, and they had one child, Brigitte. She later divorced and married Don Speer on July 10, 1980, in Las Vegas. They moved to Shawnee in 1996. Shari enjoyed, scrapbooking, traveling and spending time with her family and grandchildren.